Slice the baguette on a diagonal about 1/2 inch thick slices. Arrange slices on baking sheet. Drizzle olive oil over slices of bread. Place on the top rack in your oven. Allow to bake for 8-10 minutes or until golden brown. Remove from oven an rub each hot slice of toasted bread with the garlic cloves. Set aside. Place 1 tablespoon ricotta on 8-12 pieces of toasted baguette. Sprinkle with salt and pepper. Place 1/2 slice of mozzarella on 8-12 pieces of toasted baguette. Place on the top rack under the broiler for 2 minutes or until the mozzarella cheese has melted. 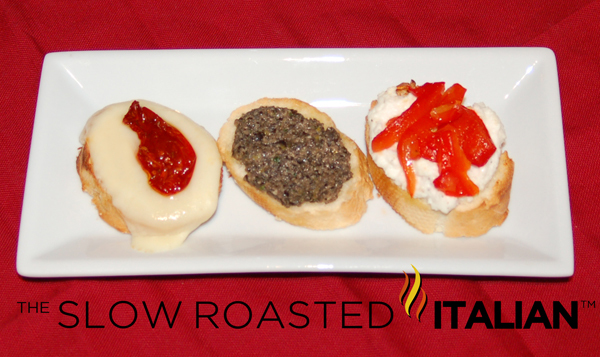 Remove from oven, top the mozarella with a sun-dried tomato and the ricotta with several pieces of sliced peppers. Arrange bruschetta on a serving plate. Serve immediately.